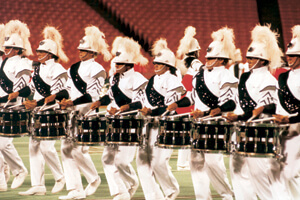 It's possible that more marching bands imitated Phantom Regiment's second-place "From the New World…To a New Age" show than any other corps production ever, at least according to what I observed during marching band contests in the years immediately after 1989. Based on Antonin Dvorak's "Symphony No. 9, From the New World" and the composer's "Slavonic Dance No. 1," this production hit an enthusiastically positive nerve with band directors and fans alike. Dvorak, a Bohemian who had been living in Prague, was director of the National Conservatory of Music in New York City from 1892 to 1895, a position he left his native land for when he was offered 25 times his then-current salary. Enamored of the music of America, he became an advocate of the indigenous music of Native Americans and African-Americans at a time when the American cultural scene was still trying to emulate that of Europe, which generally was viewed as being more sophisticated and worthy of sophisticated folk. When the work premiered at Carnegie Hall in 1893, it was interrupted by thunderous applause after each of its four movements. So popular has the symphony been ever since its premier, Neil Armstrong took a recording of it with him to the Moon during the Apollo 11 mission in 1969, where he successfully executed the first walk on the lunar surface. (If you were introduced to the work while performing a concert band version titled "Symphony No. 5," you are not imagining things. Dvorak's symphonies were originally numbered according to the order by which they were published, not according to when they were composed. The numbering system wasn't updated until the 1950s.) Regiment's show started with the "Adagio" opening of the first movement of the symphony, a lovely chorale that bore little resemblance to the power that would smack fans across the face until just before the first minute mark, when the first standstill blast from the brass section was powerful enough to pierce lead. A few seconds later, another sonic boom came out of a triangular block that featured the front "V" of horns kneeling with one leg stretched out, a corps trademark. The fast "Allegro molto" section of the first movement came next, with a flag change from bright red to subdued purple helping to alter the mood. This section of the first movement is so different in character that one could be forgiven for missing the fact that it's a variation of the "Adagio" theme. Regiment's treatment, oozing with enthusiasm, further concealed this fact. A visual highlight was when the two blocks of horns first passed through each other for eight counts on an oblique angle while facing opposite directions. Each block then pivoted 90 degrees and separated from the other for eight counts on another oblique angle to the stands, both blocks facing the same direction. Finally, with one block backing up, facing the stands, the other block, also facing the stands, meshed into the first block on a diagonal. It was future DCI Hall of Fame member John Brazale's signature use of conflicting mass at its finest. 1989 Phantom Regiment performance excerpt. Discount DVD offer ends Monday, April 30 at 8:30 a.m. ET.